January - The anticipated surge in divorces caused by the recession does not occur; divorce lawyers retrain en masse in insolvency work. February - Madonna reveals that, contrary to previous reports that suggested she only paid £50 million, she actually paid Guy Ritchie £100 million from her estimated £300 million fortune. March - Having spent her entire settlement on partying, Heather Mills obtains legal aid to launch an unexpected appeal. Fiona Shackleton invests in a bathing cap. May - Madonna reveals that, contrary to previous reports that suggested she only paid £100 million, she actually paid Guy Ritchie £150 million from her estimated £300 million fortune. June - YouTube divorcée Tricia Walsh-Smith releases a new self-help video for women going through divorce: "How to Gain Sympathy and Influence the Court". July - Madonna reveals that, contrary to previous reports that suggested she only paid £150 million, she actually paid Guy Ritchie £200 million from her estimated £300 million fortune. September - Fathers' rights group The Real Families Need Fathers 4 Justice tries to bring the M25 to a standstill by demonstrating on a gantry over the road. Unfortunately, the M25 is already at a standstill, so no one notices. October - Madonna reveals that, contrary to previous reports that suggested she only paid £200 million, she actually paid Guy Ritchie her entire £300 million fortune. November - In Re: A Family Lawyer (Shoe Condition) Mr Justice Munby issues a warning to family lawyers about their failure to polish their shoes before attending court. December - The BBC launches its new legal-reality series, The Solicitors. Viewing figures plummet. DO YOUR OWN DIVORCE! - Updated! 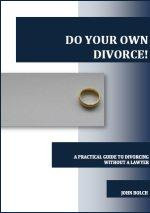 I have now fully updated DO YOUR OWN DIVORCE!, my guide to divorcing without a lawyer. Updates include changes to child support and the recent changes relating to children applications and contact enforcement. Further, I have now reduced the price of the book to just £9.99. The book may be purchased from the same page as before. Just came across this on YouTube. Brings back good memories. Enjoy. Things may be a little quiet, but I am now updating the news again on Family Lore Focus, following Xmas. I have also added another article, An Introduction to Cohabitee Property Disputes, Part I, which can be found in PDF format here and as a podcast, here. Family Law Newswatch has selected its 'Top ten family law cases of 2008', comprising what it considers to be the "ten most significant family law cases reported this year". Pre-nuptial agreements figure prominently, with Crossley v Crossley, NG v KR and the recent MacLeod v MacLeod all featuring. Whilst these cases are all very interesting, I'm not sure just how significant they are for the vast majority of those using the family justice system. Pre-nuptial agreements remain the preserve of the extremely wealthy, with very few people of 'ordinary means' entering into them. Further, attempts to have the judiciary make them enforceable are, surely, doomed to failure. As Baroness Hale made it very clear in MacLeod, this is a job for the legislature, not the judiciary. At number three in the top ten comes McCartney v Mills. I can't argue with this. Not only was it far and away the most high-profile family law case of the year, it was also of significance to more 'normal' divorces, as I mentioned in this post. Other top ten cases that I have mentioned here previously are the failed negligence claim Williams v Thompson Leatherdale and Francis and the procedural warning from Mr Justice Munby in Re X and Y (Bundles). The other four cases in the top ten are a bit of a miscellany. They comprise the publicity/human rights case Murray v Express Newspapers, the immigration/human rights case EM (Lebanon) v Secretary of State for the Home Department, the child abduction case Re M (Abduction: Zimbabwe) and the care case Re M (Fact-Finding Hearing: Burden of Proof). Not having studied these cases, I'll make no comment about them. Would I have included any other cases in my top ten? Well perhaps Behzadi v Behzadi would have made it in because of the amount of ground it covered, the 'Barder-event' case Dixon v Marchant was important, as was the Brussells II case Bush v Bush. Finally, Re A (A Child: Joint Residence/Parental Responsibility) gave very useful guidance on the subjects of shared residence and parental responsibility. Let us see what 2009 brings! 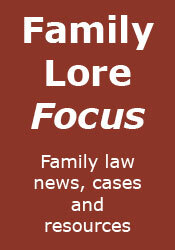 Family Lore Focus has been updated with news, judgments and the best from the world of family law blogs, and will continue to be updated throughout the festive period, during which time I also hope to add more content to the site. Today is the day for us all to celebrate, at least if you live in the northern hemisphere. The days may still get colder, but at least they will get longer. 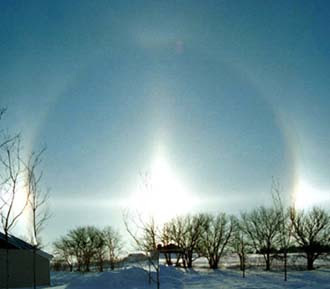 So, I wish all readers of Family Lore a happy winter solstice. Unhappy Xmas = Prosperous New Year! With grateful thanks to Jailhouselawyer for bringing it to my notice, today I write to urge all married couples NOT to read the article 'How to survive Christmas as a couple' that appeared in the Telegraph yesterday. Look, Christmas is the best thing that happens to us divorce lawyers - don't spoil it by getting on with your spouse. Further to my last post on the subject, I'm glad that common sense has prevailed over bigotry, with Islington Council winning its appeal against the Employment Tribunal ruling that it had discriminated against Lilian Ladele. To recap, Ms Ladele was employed by the Council as a registrar, but refused to conduct civil partnership ceremonies, due to her religious beliefs. Fairly obviously, the Employment Appeal Tribunal ruled that: "The council were not taking disciplinary action against Ms Ladele for holding her religious beliefs. They did so because she was refusing to carry out civil partnership ceremonies and this involved discrimination on grounds of sexual orientation. The council were entitled to take the view that they were not willing to connive in that practice by relieving Ms Ladele of the duties". Ms Ladele is now appealing to the Court of Appeal - let's hope common sense prevails there also. The DCSF has published a guide to help separating parents realise the impact of their actions on their children and provide them with support, including "an extensive list of links for further support for parents and for young people affected by separation, and other useful documents". The guide, 'Kids In The Middle' can be found on the DCSF website, in PDF format, here. The much-anticipated judgment in MacLeod v MacLeod  UKPC 64 has now been delivered by the Privy Council, and the decision was not as all had expected. Some experts had predicted that the court would rule that pre-nuptial agreements should be enforceable if drawn up properly. The court (quite rightly, in my opinion) decided that such a matter was for Parliament to consider, but did find that a post-nuptial agreement was "valid and enforceable". Briefly, the facts were that the parties, who were both American, were married in Florida in 1994. The husband was considerably more wealthy than the wife and they had entered into a pre-nuptial agreement on their wedding day. The agreement provided for each spouse to retain the separate property which they brought into the marriage and for the ownership of after-acquired property to depend upon legal title. In the event of divorce each party waived their right to claim any sort of maintenance. Properties owned jointly were to be divided equally between them. In addition the husband would pay the wife a lump sum calculated as $25,000 for each full year that the couple had been married. It was also agreed that, regardless of where the couple might later live, the agreement should be construed in accordance with the laws of the State of Florida. The family moved to the Isle of Man. The marriage subsequently broke down, and the husband issued divorce proceedings in 2003. During the marriage, two further agreements had been reached, in 1997 and 2002, and the court was concerned with the latter, which confirmed the 1994 agreement but made substantial variations to it, including a provision that, in the event of divorce or the husband’s death, the wife should receive £1,000,000 sterling, adjusted for inflation since February 2002. In ancillary relief proceedings the wife claimed full financial provision, asserting that the agreements should be disregarded, as "unfair pressure" had been put on her. The husband claimed that the third agreement should be upheld, which would have meant giving the wife £1.89m. The court on the Isle of Man rejected the wife's claim but agreed she should be given an additional £1.25m for accommodation, and said it should be paid directly to her rather than held in trust. The husband eventually appealed to the Privy Council ("the Board"), on the issue of whether the housing needs of the wife and children should be catered for by the lump sum, as ordered by the judge, or by a trust fund, as proposed by him, and the argument turned on the validity and effect of the 2002 agreement. "Post-nuptial agreements, however, are very different from pre-nuptial agreements. The couple are now married. They have undertaken towards one another the obligations and responsibilities of the married state. A pre-nuptial agreement is no longer the price which one party may extract for his or her willingness to marry. There is nothing to stop a couple entering into contractual financial arrangements governing their life together, as this couple did as part of their 2002 agreement." "In the Board’s view, therefore, the 2002 agreement was a valid and enforceable agreement, not only with respect to the arrangements made for the time when the parties were together, but also with respect to the arrangements made for them to live separately. However, the latter arrangements were subject to the court’s powers of variation and the provisions which purported to oust the jurisdiction of the court, whether on divorce or during the marriage, were void." The husband's appeal was therefore allowed, and the matter was remitted to the High Court for an appropriate trust deed to be drafted if it could not be agreed. There is a fascinating debate going on over on the Wikivorce Divorce Forum, on the subject of whether or not pension CETVs should be discounted when they are offset against other assets. Nigel Bradshaw of the Ancillary Actuary set out his thoughts on the matter in this post, and has since been taking part in the debate. As Nigel says: "The argument goes that as pensions are not readily realisable for cash then they are less valuable than other assets", but his "view is that all assets should be valued on the same basis, which is their market value assuming an orderly sale". I recommend a look at the thread, particularly for practitioners interested to read how those going through a divorce see the issue. I hope that over the (nearly) three years that Family Lore has been going I have provided lawyer readers with some useful information, and helped to keep them up to date with relevant law. Well, shortly I and other English law bloggers will be offering a service that will not only help keep lawyers up to date with their law, but also with their CPD. By way of a demonstration, I have put a sample 1-hour CPD update course on the Family Law Focus website. The course gives an example monthly update for last August, comprising a podcast, a set of notes (in PDF format), and a questionnare. Feel free to have a look (and a listen). The eagle-eared will recognise the dulcet tones of Charon QC in the podcast - he will also be taking part in this project, along with other well-known blawgers. It seems that reports that Madonna and Guy Ritchie had reached a completely agreed settlement, with Ritchie making no claim against Madonna's fortune, were somewhat premature. BBC News has confirmed reports that Madonna has paid Ritchie around £50m as part of their divorce settlement, and that arrangements for their children have yet to be finalised. As I've said before, I'm not interested in whether this is the largest divorce payout, but I am saddened that things were apparently not as friendly as was first thought - a high-profile amicable settlement would have served as an example of how things can be done. I've updated Family Law Focus, including adding news headlines, judgments and the pick of family law blogs. If you're a lawyer and you've not read Bleak House, then your legal education is incomplete. Not for the first time it has been quoted in a judgment, on this occasion by the ubiquitous Mr Justice Munby, who was saddened and appalled by what he called "ancillary relief litigation conducted at ruinous expense to the parties". The case was KSO v MJO & Ors  EWHC 3031 (Fam). I'm not going to go into the gory details of the litigation, but suffice to say it involved not just the husband and the wife but also the father-in-law and the mother-in-law, who between them made numerous applications, cross applications and even an appeal - at one earlier hearing the District Judge had been "overwhelmed with applications and issues". As a result of all of this litigation, Mr Justice Munby calculated that the matrimonial 'pot' had been reduced to "a wretched 28.22%" by the costs incurred. As Mr Justice Munby said, the end result was unsurprising: "The litigation simply collapsed under the unsustainable burden of paying costs which had long since become wholly disproportionate to anything at stake and which, by the time the parties arrived at the FDR, had swallowed up a grotesquely large proportion of the never very substantial assets. On 26 November 2008 I received the news that the husband had earlier that day been declared bankrupt on his own petition." "The picture is deeply dispiriting. And it is not as if it is only the adults who suffer from the consequences of such folly. The luckless children do as well. The present case is a sobering, and for me deeply saddening, example. If, instead of spending – squandering – over £430,000 in costs, the wife and the husband had been able to resolve their differences at a more modest and, dare I say it, more seemly level of costs, there might very well have been enough left in the matrimonial 'pot' to house the wife and children and to enable the children to remain at their school, whilst still leaving something more than a mere consolation prize over for the husband. As it is, it is hard to see much being left from the wreck, not least after the trustee in bankruptcy has had his costs, expenses and remuneration. It is difficult not to be reminded at this point of Jarndyce v Jarndyce (see the Appendix). And the wife and the husband – and for this purpose I refer to them as the mother and the father, for that is what they are – are faced now with the wretched and thankless task of trying to explain to their daughters how it has all come to this." The One Law for All Campaign against Sharia Law in Britain launches at the House of Lords today, International Human Rights Day, the sixtieth anniversary of the adoption of the Universal Declaration of Human Rights. The campaign is seeking legislation to curb the influence of sharia law in Britain. It has already received widespread support, and you can add yours by signing the Sharia Petition. The daily news update is now on Family Lore Focus, with several items referring to the new powers relating to contact orders, which came into force today. As all family lawyers will be well aware, the new powers in relation to contact orders under the Children & Adoption Act 2006 come into force today. Frances Gibb in an article in The Times today suggests that the powers may actually 'worsen parent wars'. She says that: "Family judges have told The Times that the measures, although welcome in principle, could damage tense family relations, rebound on fathers as well as mothers and fetter judges’ discretion." As to the last point, she says that one judge has pointed out that the wording of the powers appeared to indicate that breach of a warning notice would require courts to impose penalties, with no discretion. On the other hand, the new powers have been welcomed by others, in particular fathers' rights groups, albeit with reservations. So, will the new powers make things better, or worse? As usual, only time will tell. It is Sunday morning. Muhammad is trying to rest in the sun. I am scanning my favourite blogs, and the news online. "I must say, he bears a remarkable resemblance to Robert Redford." I said, pointing at the post on Charon QC. "Remarkable." Replied Muhammad, rolling his eyes and yawning. "Excellent podcast though." "Yes, this Scott Greenfield sounds a very interesting chap." "Yes, a very interesting err... chap." "Fascinating what he says about post-9/11 justice in New York." "Yes. He seems quite a funny chap too." I said. "He certainly has the measure of Geeklawyer." "Well, so far as anyone can." Replied Muhammad, stretching his paws and returning to his slumber. He was clearly more interested in his sleep than the news, so I said no more. Muhammad can be very grumpy when he doesn't get his sleep. But then I found a story that I knew would interest him. "Hey, look at this!" I exclaimed. "In the Guardian yesterday." "What?" Asked Muhammad, irritably. He reluctantly stirred himself. "An article about pets and divorce. Amazing." "Why's that?" Asked Muhammad, dubiously. ""Eight years ago, Dr Stanley Perkins and his wife, Linda, a professional couple from San Diego, were reputed to have spent up to $150,000 in a two-year battle over who should get custody of Gigi, the pointer-greyhound cross-breed they had got from an animal shelter two years before."" I quoted. "Spending that much on who has a pet?" I replied. "Ridiculous." Muhammad's tail began to wag in annoyance. "I don't see the problem," he said, "arrangements for pets after divorce are very important." "But listen to this." I said: ""Reports by animal behaviourists, bonding studies and a Day in the Life of Gigi video were all presented to the judge, who ended up awarding custody to Linda, who had insisted during the hearing that she was Gigi's "mommy", and even produced a birthday card from Gigi saying as much." Crazy." "I'm sorry," said Muhammad, "but I don't see anything crazy about that. Pets are people too." His tail wagged more vigorously. I could see that it wouldn't be prudent to say any more on the subject, so I read on in silence. Somewhat belatedly my post 'Sorry but I can't sign this...' has been picked up by fathers' rights groups around the world, and they have been sending me their views, both by commenting and by email. Predictably, their reaction has at times been a little extreme. Look, gents, I know that some of you can't bear to countenance someone who dares to hold a different opinion, but I can only tell it as I see it. I do appreciate feedback, whether in support of or against my views - after all, dialogue is what blogging is all about, and I apologise for the fact that I simply don't have the time to reply to those who have made serious points. However, such remarks as: "What sort of solicitor are you? One of the three monkeys are you. Clearly all three. Deaf dumb and blind" and: "Are you a femi-nazi John?" (whatever that is) are not acceptable, and do your cause a disservice. I don't do legal aid work at present. Nevertheless, the other day I received a copy of the first Community Legal Advice News, a bi-monthly email newsletter to keep you updated with CLA service news and developments. If you haven't received a copy, you can view an online version here. If you would like to receive it by email, there is a link towards the bottom, where you can sign up. It makes a nice change to come across a Court of Appeal ancillary relief decision involving people of modest means. Such was the case in Fallon v Fallon  CA (Civ Div), where the husband was appealing against an order that (originally) required him to transfer an endowment policy to the wife, pay her a lump sum of £75,000 and make nominal periodical payments. At the first appeal it was accepted that the case had proceeded before the district judge on a general mistake of fact, namely that W had the right to buy 25% of the equity in her secured tenancy for a payment of £63,500. Nevertheless, the judge essentially confirmed the district judge's decision, as she "was experienced and careful and had reached her decision after a long trial". The Court of Appeal found that the judge had made a fundamental error in relying upon the district judge's quantification (rather than looking at the s.25 factors afresh), when that quantification had been based upon a general mistake of fact. Applying the s.25 factors, in particular assets, needs, ages, the length of the marriage and contributions, the Court of Appeal reduced the lump sum to £40,000 and struck out both the order relating to the endowment policy, and the maintenance order. The primary reason for so reducing the wife's award, it seems, was that most of the capital had been acquired by the husband after the marriage had ended. Unfortunately, the Gazette report does not indicate what percentages of the total assets each party received, but it appears that the husband received substantially more than 50%. I have updated Family Lore Focus, including adding the first article, on the New Children Act Forms. OK, here's the killer essential App for all you iPhone geeks: the Marriage Calculator. Answer a few simple questions, and it will tell you how long your marriage is going to last. Brilliant - you can then book that appointment with your divorce lawyer months, or even years, in advance. A review can be found here. The Times has reported the appeal of Lady Anne-Marie Judge, former wife of the Conservative "grandee" Sir Paul Judge, who is seeking to re-open her divorce settlement after seven years, claiming that the original distribution of assets from the marriage was based on a mistake, in that £14 million of the £30 million assets was discounted, as Sir Paul was thought to owe that to a charity, of which the couple were trustees. In the event, he persuaded the Charity Commissioners that he did not need to reimburse the charitable trust and so was better off by an extra £14 million. Lady Judge therefore claims that she is entitled to a further £5 million. Her application was refused by Mr Justice Coleridge, and she is now appealing to the Court of Appeal. Looking forward to the outcome of this one, and reading the report. Regular viewers of this blog may have noticed that things have been a little quiet here over the last few days. Fear not, I have not been idle. I have been working on a new project that is just about sufficiently advanced for me to reveal to the world. 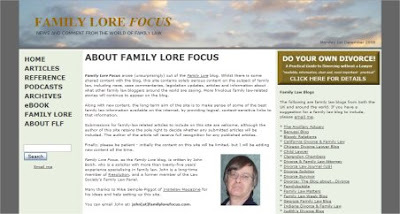 Family Lore Focus will contain news and comment from the world of family law. The site is intended for serious content on the subject of family law, including news, case commentaries, legislation updates, articles and information about what other family law bloggers around the world are saying. More frivolous family law-related stories will continue to appear on this blog. Suggestions for content and submissions for articles to include on the site are welcome. I always appreciate a serious review of a serious book, so it was not difficult for me to make my choice for the best post last month. Scott Vine at Informationoverlord has reviewed the latest edition of that perennial lawyer's favourite, Chitty on Contracts, and his post Chitty is therefore my November Post of the Month. In these iconoclastic days it's good to see an institution such as Chitty being given the respect it so richly deserves, and Scott does not disappoint, although I'm not sure about his suggestion that you should "give the one you love Chitty for Xmas this year", as you may find yourself in need of consulting me in the New Year. The prize of a virtual Fender Strat signed by the one-and-only Mr Todd Rundgren is as we speak winging its way to the lucky Mr Vine.